Beautifully carved wall panel with burnt antique finish. Leveraging on our extensive market knowledge, we are providing a high-quality range of Designer Wooden Screen Panel. Packaging Type: in corrugated box. 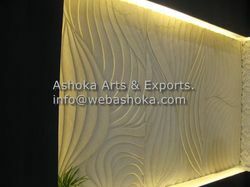 We offer high quality of Wall Decorative Panel. Kund Multi wall Panels are made of natural slate with split face look are highly deemanded for external wall cladding for many architectural projects. With having experienced work force we are the leading wholesaler and supplier of premium range of Exterior wall cladding Tiles in Jaipur. We are involved in providing quality assortment of Buddha Wall Panel. The Wall Panel that we offer is highly durable and scratch proof. Stone Mart India offers natural stone walling for interior and exterior home design. Buy stone teak sandstone walling, mint sandstone walling, Raj green sandstone walling, etc from Stone Mart near you at Civil Line, Jaipur.